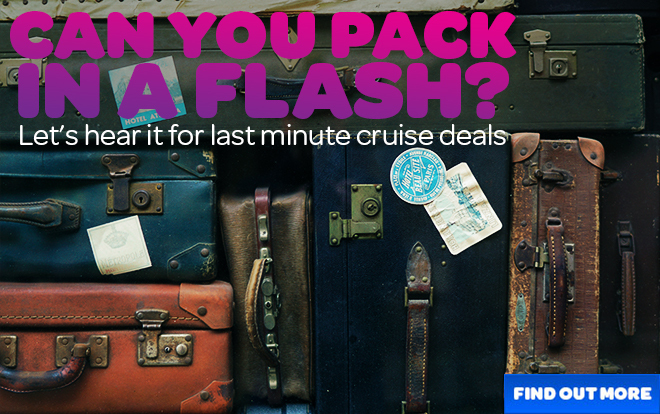 Last Minute Cruise Deals: Can you pack in a Flash? Is your Passport up to date? If you are happy to leave your planning to the last minute or find you have a sudden window in your calendar for some R&R time, then check out our Last Minute cruise offers. Last minute deals often mean you cannot choose the exact cabin number, but if you are happy to be flexible and leave the choice of cabin to the cruise line, then there could be a bargain waiting here just for you.Check back regularly as our Last Minute Cruise deals are updated all the time. Space is limited so don't linger long over your decision as these deals are gone in a Flash!